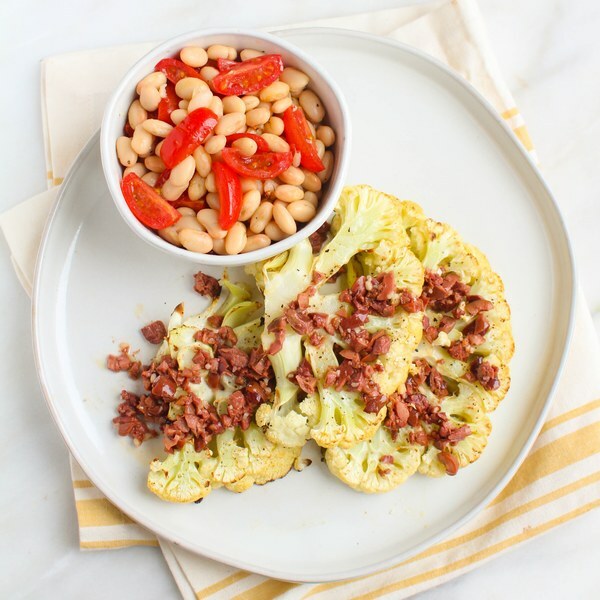 ← Cauliflower Steaks with Kalamata Vinaigrette & White Bean Tomato Salad. Preheat oven to 500°F. Using a paper towel, lightly coat a sheet pan with oil. Wash cauliflower, cut off leaves, and trim stem. Slice lengthwise into ¾ inch steaks. Place steaks and loose florets on sheet. Rub with oil on each side and season with salt and pepper. Place in the oven and roast for 15 minutes. Flip and continue roasting until tender and browned, another 5-6 minutes. Then broil for 2-3 minutes to create a golden crust. Peel and mince garlic. Finely chop olives. In a small bowl, mix together garlic, olives, lemon juice, oil, and salt. Set aside. In a medium bowl, prepare salad dressing by whisking together oil, lemon juice, salt, and pepper. Drain and rinse beans; place on paper towels and pat dry. Add to bowl with dressing. Wash, quarter, and add tomatoes to bowl. Toss salad. To serve, place cauliflower steaks on a plate, drizzle with vinaigrette, and have with salad on side. Enjoy!